Title: You Majored in What? "In times like these it's crucial to look at entering the workplace from a whole new perspective and You Majored in What? accomplishes this! Who cares what your college major is? What is more important are your dreams, values, and strengths and this book helps any young person figure these things out and find a career that fits. Buy it now! It's great! "—Julie Jansen, author of I Don't Know What I Want, but I Know It’s Not This! 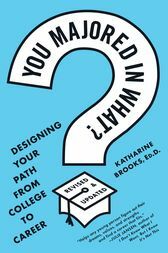 Katharine Brooks, Ed.D. is director of Liberal Arts Career Services at The University of Texas at Austin. A nationally recognized career coach, trainer, professor, and counselor for more than twenty years, she is also the creator of the National Association of Colleges and Employers Career Coaching Intensives, highly successful, sold-out training sessions for career counselors. She has a doctorate in educational psychology.